Published June 11, 2012 By Anna T. This post may contain affiliate links. Regardless, I only recommend sites I've researched and/or used and trust. Are you gifted with a camera? Images are always in demand! This page has a ton of ways you can earn money using your camera — even if all you have is a smartphone. And no, you don't necessarily have to be an expert to begin earning. 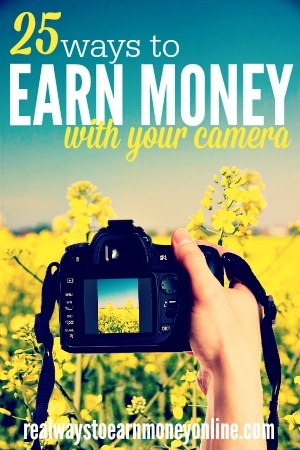 Even novice photographers can use some of these sites/companies to begin earning an income. 123 Royalty Free – Upload your photographs. If they are purchased by customers of 123 Royalty Free, you will receive 60 percent of the sale price or subscription download price. Big Stock Photo – For Pay As You Go purchases we pay you 30% of the US dollar price every time a customer downloads one of your images (up to $29.70 for an extended license). For purchases made using credits we pay $0.50 USD for each credit spent. Can Stock Photo – Every time one of your images is downloaded you will earn a commission. Also, if you refer another photographer to us, you will earn $5 USD for every 50 photos they sell. CreStock – Earn royalties on your uploaded images. Your royalty rate is calculated on a progressive scale, based on your total number of images sold since joining Crestock. Deposit Photo – Pay is dependent on author level. Dreamstime – Sell your stock images and get 25 to 60 percent of each sale you make. Anyone can sign up, but only quality photos are accepted. Fotolia – For every file sold, you will receive a royalty payout based on your portfolio exclusivity and ranking. iStock Photo – iStock pays contributors a base royalty rate of 15% for each file downloaded. If you are an Exclusive contributor you can earn up to 45%. Paid Pictures – Submit seven pictures for review. If they like what they see, they may start sending you paid photography assignments. Shutterstock – Make your creativity shine at Shutterstock and watch your earnings grow. Get your work seen by the high-volume buyers who prefer Shutterstock. It's free to contribute and you'll earn $0.25 to $28.00 per image download. Foap – Sell your iPhone images and split the profits with Foap. Pays with Paypal once per month, but you must request a cash out to get paid. Scoopshot – Pick up photography assignments via this app and get paid. Snapwire – Read Review – The anti-stock photo site may pay you for your authentic smartphone pics. Stylinity – Read Review – Take pics of your clothes, post them on Instagram, and get paid if your followers buy your look. Airbnb – Read Review – Hires freelance photographers worldwide. If hired, you'll cover your local region. Mendr – Read Review – Hires freelance photo editors to edit user-submitted photos. Open worldwide and pays with Paypal. Obeo – Read Review – Obeo is always looking for experienced or amateur photographers to photograph homes for sale. OnSource – Read Review – Provide photo and video services for OnSource and work on your own schedule. They pay every two weeks. PR Photos – Get paid for your photographs of celebrities each time they sell. Don't Think Your Skills Are Up to Par For This? Digital Photography 101 is an inexpensive, $20 e-course on Udemy that's rated at almost five stars. It contains 44 different lectures and is tailored to people just beginning in photography. You can go through it entirely at your own pace!